LIVE INCIDENT: Police and emergency services at suspected fire-arms incident in Leeds tonight. There is police activity around Reginald Street in Chapeltown tonight following what might be a firearms incident. Police and the force helicopter are scouring parts of Chapeltown in the city this evening (Wednesday) after reports of a serious incident. Calls were made to the emergency services at around 7.20pm and when police got to Reginald Street in Chapeltown they found a male with head injuries. 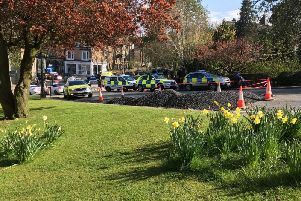 It is believed that an air ambulance has just left the scene and a police spokesperson said the incident is possibly "fire-arms" related.